Bernie Sanders shocking upset of Democratic frontrunner Hillary Clinton in Michigan’s Democratic Primary this week has shown a weakness that may have been overlooked before. In fact, Bernie Sanders may have illuminated the trail Donald Trump could follow this fall to win the general election. Clinton was supposed to coast to victory in the Great Lakes State and the polls up to election day showed her with a commanding lead of better than 20 points. At some point, however, the grassroots began to swell and revolt and the political earth moved under her feet. 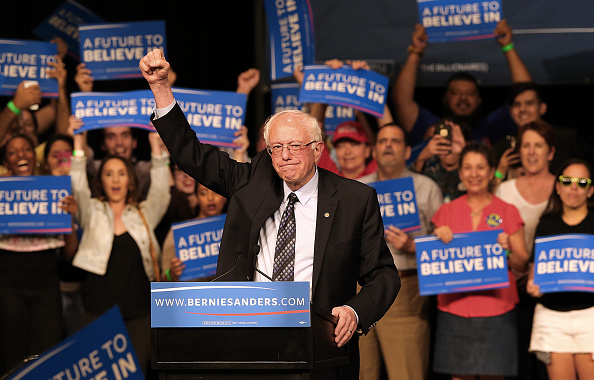 In the wee hours of the next morning, Bernie Sanders, the avowed socialist with a populist message had officially defeated Clinton by more than 20,000 votes. I am certain, Donald Trump and his team took notice and began writing a script to win the whole thing. In the post mortem of the huge political upset, many are wondering how could it have happened. Had Republicans pulled a dirty trick and crossed the aisle some asked. I mean seriously, could professional pollsters really miss the mark by more than 20 points. There were at least 15 polls in Michigan in 2016 and not one showed Clinton with anything less than a double-digit lead. The answer is yes. They got it wrong. Let me make it easy for you. Bernie connected with disaffected Michigan voters that see jobs evaporating and the country they grew up in disappearing in front of their eyes. They believe the country is under attack from forces both inside and outside of our borders. They support the idea of fighting back. Quite simply, they have had their fill of ‘Hope and Change.’ That sounds a lot like Donald Trump supporters doesn’t it? Simply put, thousands of the Bernie voters and Trump voters are people at lower income levels that are commonly referred to as disaffected voters and they have gravitated en masse toward these two very unconventional candidates. Those in these economic classes are more often less educated and more easily persuaded to a populist message. They may be more susceptible to ideas of free college and walls at the border. Even though neither idea is likely to happen any time soon. They are more pre disposed to take on the ‘us versus’ them mentality. This is why backers of Bernie Sanders and Donald Trump are more prone to verbal and sometimes physical altercations. When it comes to issues like trade and more specifically NAFTA or the ill advised TPP- both groups are ideologically indistinguishable. Which also feeds the odd phenomenon of Sanders and Trump voters willing to consider supporting the other- this is counter intuitive to the casual observer but is actually at the foundation of the groundswell against ‘establishment’ candidates in 2016. The disenchantment and dissatisfaction with government is at an all time high in America following seven years of what many, obviously consider, a very weak Presidency. Those are a couple of the fundamentals in play this year. Donald Trump should look closely at Bernie Sanders big win in Michigan because it likely holds the key to winning the general election. Hillary Clinton should look at the embarrassing loss in Michigan as a harbinger of things to come. We have a microcosm of America right here in my home state. Michigan much more closely resembles the national electorate in demographics than any other state that has voted so far. Simply put, if an avowed socialist can take her down in Michigan she is vulnerable everywhere. I can assure you that Donald Trump, by giving a voice to millions of angry Americans is putting himself in a position to become the next President. Bernie will of course never be the guy because on the Democratic side, the process is rigged in favor of Clinton. Here is the bottom line: there are two things people will ask themselves before they vote in November: first am I better off than I was four years ago- and maybe more importantly, am I safer? Donald Trump should ask those questions over and over again while standing in front of abandoned coal mines in Pennsylvania- he should also thank Bernie Sanders for showing him how to defeat Hillary this fall.